I knitted this doll using the same pattern as Loofah, only on the large end (8 peg) spool Knifty Knitter instead of the flower loom. She’s very tiny, about 4″. I think if I were going to make these dolls to give away, I’d have to find a way to keep the stuffing in place. As it is, you can tell the gaps between each row are so large you can see the polyfill. One idea I had is to use a child’s sock as a way to stuff the doll. I can also use a tighter stitch like I do for the head. One more problem I’m having is with the hair. Right now, it looks okay, but it’s not durable and wouldn’t stand up to much playing. I separated strands of Lion Wool Ease but as they come apart, it’s easy to tear off sections. I need to research a way to make decent hair. 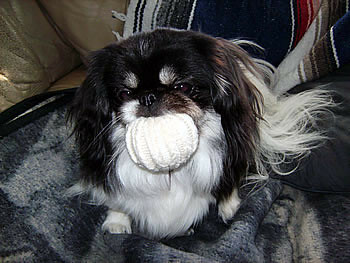 When we were visiting family over Thanksgiving, I knitted this ball with the flower loom. My plan was to make three of them, print out a “How to Juggle” tutorial, and give them as a gift. However, the little dog of the household got one look at this ball and decided it was hers. How could I refuse that face?? 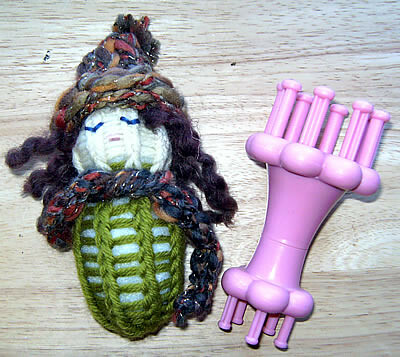 I made this loomed dolly on the smaller (12 peg) flower Knifty Knitter. The pattern is Lulu the Loomed Dolly, and it’s Bev’s from Cottage Garden. 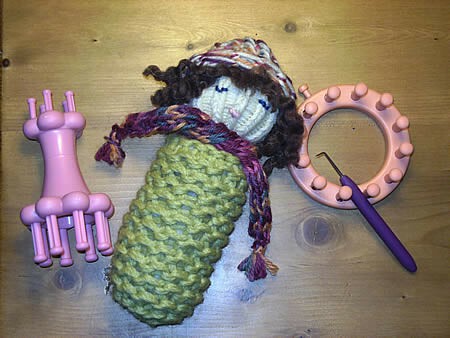 She loom knits Lulu Dolls for charity. When I saw her dolls, and I saw the Lulu that American Girl in Italy made, I had to give it a try. I used Lion brand wool (worsted weight) for the head and some left-over medium-weight wool for the body. I didn’t have the 18 peg loom that Bev uses, so I used my brand-new flower loom. Compared to the smallest loom in the KK round loom kit, this one has 12 pegs vs. the 24 peg blue loom; however, it’s still large gauge. It took me awhile to decide what stitch to use, because I knew I wanted the head to look different than the body. After starting four times, I ended up using a 1-over-3 wrapping and just the basic knit stitch. How I do this is I single wrap each peg, and I go completely around four times total. I then knit the bottom loop over the three remaining loops, and I do this for each peg. I then wrap just one strand around all pegs and continue. I made the head this way by knitting 24 rounds. (If I was using thicker yarn it would have been many fewer times around.) I then switched colors and started the body. I used two strands here, plus I choose the garter stitch. I knitted Loofah’s body to be twice as long as her head. When I neared the end of the body, I decreased by putting one existing loop on the neighboring peg and knitting off. I did this all around so I was left with six loops. I then gathered them all together just like a hat. I stuffed the doll with polyfill, and gathered the head. When Loofah was at this stage, I decided the garter stitch wasn’t exactly attractive. It was, in fact, sorta odd looking. 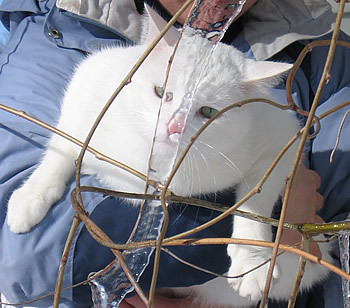 Although I had played around with some cutsie names like Magnolia, in the end, she most resembles a loofah gourd, so that’s her name: Loofah. 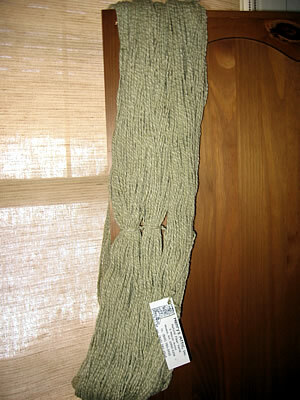 I knitted a little scarf on my other new KK loom: the spool loom. It makes two different sizes of i-cords. I used the smallest side, and I even added some tiny tassels. I then knitted Loofah a hat, so I went back to the flower loom and knitted about two inches. I decreased the top of the hat and gathered it off. The brim curled up on its own. Finally, I decided Loofah needed some personality, so I had a try at stitching a face. She has a tiny pink mouth, two blue eyes, and some wild hair. 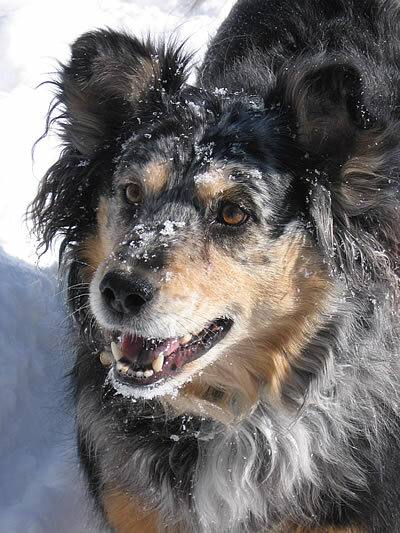 You may notice one of her eyes is crooked–looks like I need some practice! Because she’s wool, I wonder if she’d felt at all if I washed her. I’d have to de-stuff her first, but it may be a cool look. At this point, though, I’m a little attached to her, and I’d hate it if something bad happened to my lil’ Loofah. I think Loofah was a great first doll. She’s pretty much a tube with a scarf and hat. Now that I have these smaller looms, it’ll be fun to knit her new things once and awhile like a blankie, shawl, and maybe even a couple of snazzy tube dresses! By the way, it’s sure nice to have the kitties nearby. Whenever I need help choosing a color, they’re right there to lend a helping paw. Dishcloth (knitted with needles) finished! It’s a little bit crooked! And the edge that I ended on looks square instead of rounded. Oh well, here it is in all its glory: my very first knitted-with-needles FO. I enjoyed it, even with all my mistakes. 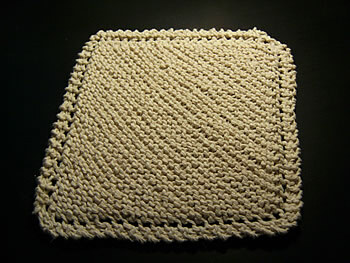 The funny thing is that I see this particular dishcloth pattern everywhere now that I made one. I saw two for sale yesterday, and we even have one in our own house, something that was left behind from the previous owners. What should I make next on the needles? I’ve always wanted to make a calorimetry and also a Kitty Pi but both of those take some expertise. We’ll see. Maybe another dishcloth! Posted on November 18, 2007 March 25, 2014 Categories Finished ObjectTags dishcloth, finished project, knitting, needles2 Comments on Dishcloth (knitted with needles) finished! How cool is this? A loom-dedicated online ‘zine called, appropriately enough, The Loom Knitters Circle. Featuring patterns, articles, and a forum, this great site is just what loom knitters have been asking for. Visit it today! As far as my own projects, I didn’t take any pictures but over the weekend I knitted four little hats for my nieces’ American Girls dolls. I used the blue loom, two strands of Moda Dea yarn, and invented a slightly different pattern each time. I also finished my ziggy-zag scarf. In the end, I probably used 1.5 skeins of yarn. I’ll post a picture, soon! 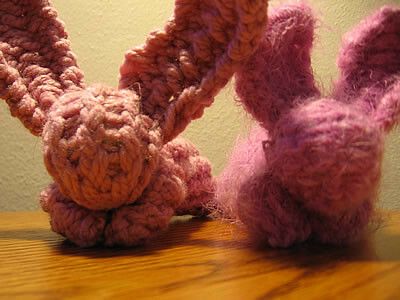 What better way to spend a snowy weekend than knitting a couple of cute bunnies? We may have had 20″ of snow this weekend, but these little, cute, pink, fluffy bunnies didn’t seem to care. 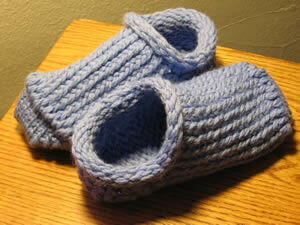 I used the blue loom and the free pattern (PDF) from the Loom Knitting store. 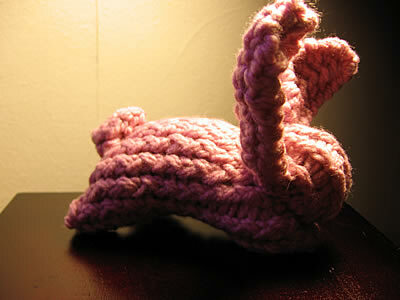 These bunnies knit up in about an hour. You start by knitting a flat panel using 15 pegs. Then, you knit two ears, a tail, and you sew it and stuff it. 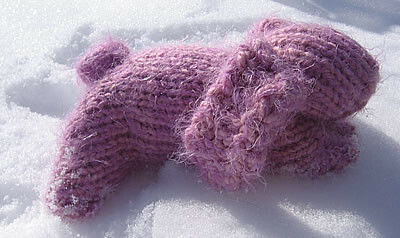 For my first bunny I used two strands of Bernat Softee Chunky. When I started the ears, I accidently read the pattern wrong and knitted at least two rows too many, but it looks sort of cute that way, more like Amigurumi than a bunny. 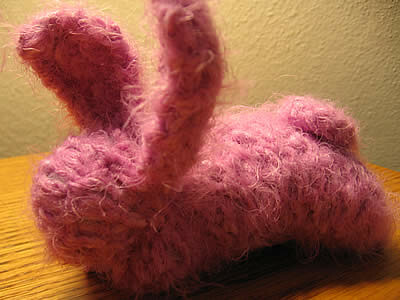 For this bunny, I kept the “knit” side facing out. I then did another one using two strands of Moda Dea Dream (Color: Blush). It’s very soft and fluffy. I probably should have used three strands because they were so skinny… Next time, maybe. This one I followed the ear pattern more closely and they turned out pretty cute. 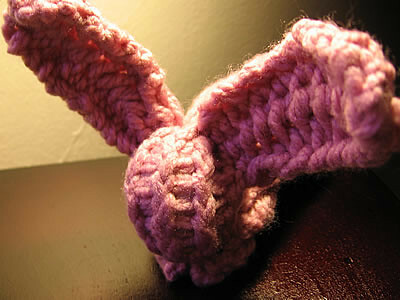 This bunny has the “purl” side facing out. These bunnies are very small–no more than six or seven inches long. I’d like to knit a bigger bunny, maybe using the blue loom but instead of just 15 pegs, I’d use all 24 pegs. I’m guessing I’d have to knit at least 40 rows. 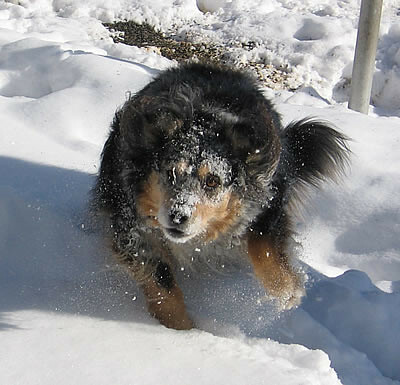 If it keeps snowing, maybe I’ll do just that! P.S. Hey, all you Vox-ers. Did you know you can now customize your banner? B designed this new one of my yarn lovin’ cat! Posted on February 25, 2007 March 25, 2014 Categories Finished Object, Loom KnittingTags blue loom, bunnies, finished project, knifty knitter, knitting5 Comments on Bunnies! I’ve always wanted to try to knit mittens, so I bought yet another skein of Lion’s Brand Wool Ease Thick & Quick and gave it a shot. I tried this pattern which uses the blue loom and knits the mitten in one piece, thumb included. The only sewing is the top and the sides of the thumb. I chose the flat stitch so the mitten wouldn’t be loose, and I think they ended up okay. 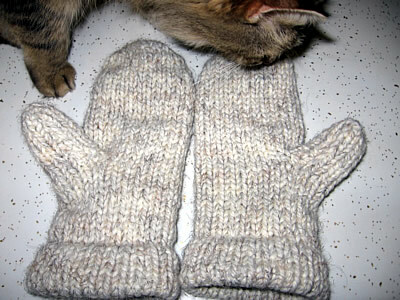 Not great, because I changed the top of the mitten. The pattern called for a gathered top, like a hat, but I decided to do decreases and stitch the top like a flat panel. Did it work? Yes and no. For one thing, using the flat stitch made me have to guess the number of rows–I needed more than the pattern called for because the flat stitch is so tight. Also, I have a lot to learn about decreasing because the mittens look a little off on the top, plus my stitching is bumpy. They work, though, and I was able to toss snowballs for my dog to chase while my hands stayed warm. These would be even better if I could line them with flannel, but until then, they’re just fine. My other cat, the one who doesn’t bother me when I knit unlike this one, just had to take a look. I think she was impressed. I can always tell when she likes something because she lies down on it, and that’s just what she did. Posted on February 12, 2007 March 25, 2014 Categories Loom KnittingTags blue loom, finished project, knifty knitter, knitting, mittens5 Comments on Mittens! Denise Layman designed the April Showers dishcloth, and I couldn’t resist giving it a try. I used the blue loom and less than one skein of Peaches and Cream cotton yarn (two strands), and followed the directions on the Knitting without Needles website. This was fun and fairly easy (all you need to know is knit and purl), and if you can see the picture clearly, it should look like a flower. I now have the bug to make other dishcloths, and although it worked fine on the blue KK, I’d like to try them on a fine gauge, loom, too. All you really need is a dollar’s worth of yarn, a pattern, and an hour or two. I bought this hank of Henry’s Attic 100% organic cotton a few weeks ago, and as always, whenever I get “nice” yarn, I have trouble deciding what to make with it. I’m considering a pullover vest, but I have yet to find a KK pattern for one I like. (Matter of fact, I can’t find any loom patterns!) I’d like to use the mock crochet stitch, which is very delicate and pretty. 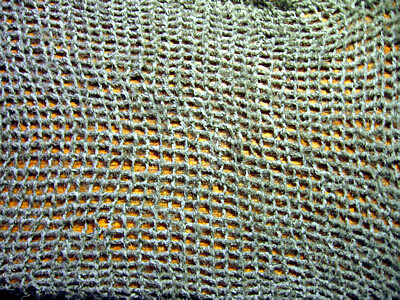 Here’s Isela’s movie on how to knit it on a loom, plus here’s Brenda’s lacey scarflet, a pretty example of the stitch. I came across this website with links to a ton of loom-knitting blogs and patterns. Maybe I’ll find a pattern for my cool yarn! I finally finished one panel of my afghan. I’ve been using the purple loom, and I’ve discovered that making an afghan is a true test in endurance. My hat goes off to all you afghan-makers out there! This is one big project. I’m using Red Heart Super Saver (because it’s cheap), and I do a zig-zag wrap using the whole loom. The panel I finished is divided into five “squares” of thirty-three rows apiece (plus one row where the old color stops and the new color start). I alternated colors (blue, brown/multicolor, cream, multicolor/brown, blue). The next panel will probably be different colors (brown, cream, multicolor, cream, brown), and the final panel will probably be the same as the first. B says it should be five panels wide, but I think it’ll be mid-summer before it gets finished if I add two more. Once my purple loom was free, I tried to knit a rug/mat out of this hemp twine I bought a few weeks back from a groovy bead shop. It smells like patchouli! I used a figure-eight wrap and it ended up a perfect square. Not quite a rug, not a placemat. What is it? My wrist hurt after knitting this, and my KK pick was bent, and I’ll send out a warning. Pick a thinner hemp if you plan on doing this. I think it would make a great outdoor welcome mat if the gauge was a little thinner, and I had twice as much. The double-knit end result from the purple loom is really cool. My shrug. Oh, the poor thing! I stopped after I finished the main section. All I have left is the arms, but I just… don’t… like… it… There, I said it. It’s too green and hairy. I’m letting this sit for the time being because I may come up with another use for it, or I may decide I really, really want a green and hairy shrug after all. We’ll see. Over the weekend, I made yet another pair of slippers for myself. Yes, this is the third pair I’ve made for myself, the fifth pair total. 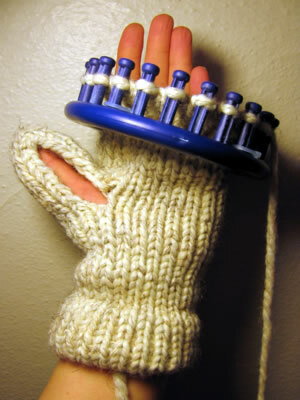 However, this time, I used the toe-up pattern that’s in the “files” section of the Knifty Knitter’s yahoo group. I used the blue loom and it was really easy. I like the toe-up slipper because there’s no seam at all in the toe area. It’s fun. You start off by creating the toe (the blue loom uses pegs 1-12) and then decreasing and then increasing. (It’s all in the pattern). Then, here’s the fun part, you pull those original stitches over to pegs 13-24. The toe looks like a flat circle at this point. Then you start the foot, and as you add row after row, you can see the toe emerge. 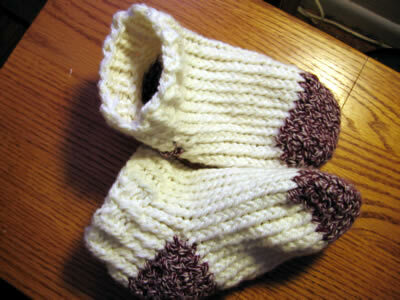 Rowena also does a version of a toe-up sock, and she has pictures on her blog. The first time I tried this, I was using a flat stitch, and I just couldn’t pull the stitches across to the other side, because the stitch was too tight. This time I used the regular e-wrap stitch, and it worked really well. I used Bernat’s Denimstyle yarn, which was okay for this project but not great. It’s part cotton and really doesn’t have any elasticity to it. It’d be great for a sweater or a scarf. Another first for me–I used two colors. Red (batik) for the toe/heel, and white (canvas) for the foot/ankle/cuff. I think they’re cute and super soft, and they’re the perfect thing to wear to bed if your feet are cold. Next project: A bag. Yes, once more I’m going to try to make a bag. I think what happened is that the bottom was so overdone it kept a strong shape, while the sides were flimsy in comparison, and when I tried a tighter stitch, it just brought in the sides even more. 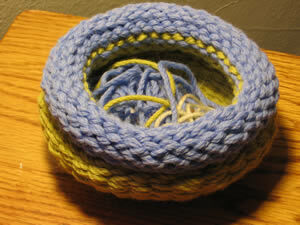 So, I now have a bowl made of yarn. It’s sort of cute, and I may try felting it someday. In the meantime, it’s holding all those little scraps of yarn I trim off of my projects. Now for some good news. I actually used the final amount of my Bollicine yarn and made myself a pair of slippers in just two hours–I’m getting faster. I used the blue loom and the same pattern I’ve used for the others I’ve made (Isela’s pattern for ribbed socks–PDF document). Because this yarn is thinner than the others I’ve used, I had to use two strands throughout. This time, though, I knew I had a limited amount of yarn and I didn’t think I could spare enough to make a full cuff or even a short, ribbed cuff, thanks to the dreaded bag/bowl fiasco, so I knitted just five rows and let the tops roll down. This is the same type of “rim” my bowl has, so I knew I could get away with that type of cuff. The rest of the slipper was identical to the others. I turned the heel, knitted 16 rows for the foot, and then did the toe. Now that I’m on my third use of this pattern, I’ve figured out how to avoid having a small hole in the side of the heel. For some reason, I always end up with a hole near the first peg. This doesn’t happen near peg 12, just the first one, so this is how I correct it. I knit the entire heel just as Isela lays out. I knit the very final row of the heel (from Peg 13 to Peg 1), and then I’m ready to start from Peg 1 to go back in circular rows for the foot, only I start out by wrapping Peg 24 first, and then I wrap 1, 2, 3, etc., all the way around to peg 23. I then wrap 24 again (Peg 24 now has three loops on it), and KO all the pegs, including TWO loops on Peg 24 so there’s only one loop left. There may be a better way to do this, but I haven’t stumbled across it yet. I wonder if the reason why I have this problem is that I always wrap in a clockwise manner. Maybe if I wrapped in a counterclockwise manner, this would go away. Something else to think about. Aren’t they cute? I wore them for a few hours, and it looks like my foot is still inside. I ended up doing this: 1) knitted ten rows and brought up the first row to make a cuff and knitted off. 2) turned the heel. I used the flat stitch because I wanted the slipper to be a little more snug than the others I've made. However, it made it look a bit shrunken. 3) knitted 24 rows with the knit stitch. 4) turned the heel using the flat stitch. Overall, they'll work. I just need to find a way to put some type of stitcky thingies on the bottom so they aren't so slippery. I don't know how to do this. I wonder if there's a fabric glue that would work. I'll have to look around tonight. I also tried a hair scrunchie for the first time, but it's a bit skimpy so I'll do another tonight. 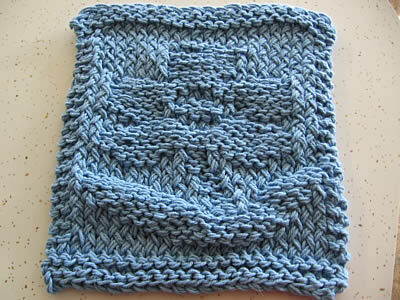 I used the blue loom, knitted six rows (using two strands) with this angora-type yarn. I think I should have used one strand and knitted about ten rows, because this is too bulky. I put a hair elastic inside the loom and brought up the bottom row, just as you would if you're making a hat brim. This was a little tricky because you need to stretch the hair elastic to make it work. Now, here's where I made another mistake. When I cast off, I pulled the final strand of yarn too tight so I can't really stretch the scrunchie over my hair easily. (Since then, I've discovered this pattern, and this one, and this bind off method, appropriately called the Super Stretchy Bind Off Method. Scroll down to the bottom of the page.) This project only took a few minutes, though, and I can see how it would be fun to make as a gift. Other projects I'd like to try soon: mittens, shrug or vest, rug (I read how a woman looms rugs out of hay bale twine and I'd like to try that), new slippers for me with a ribbed leg… I'm sure there are a few others I've forgotten! 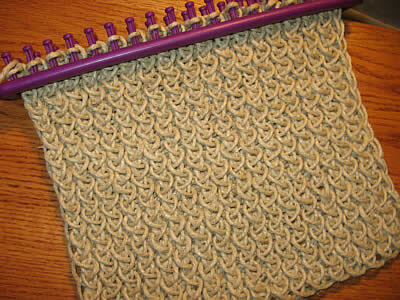 Posted on January 8, 2007 Categories Finished Object, Loom KnittingTags blue loom, finished project, hair scrunchie, knifty knitter, slippersLeave a comment on Dad’s Slippers–Done! I finished the meant-for-my-dad-but-now-are-my-husband's slippers this morning. I like this method of making the toe. I started the toe and, just like the heel, turned it but used the flat stitch this time. I then gathered the loops with a darning needle off the loom using a flat removal method (you zig zag across the loom). It's fun to pull the toe closed and see it all come together. These were DEFINITELY about 1.5" too long for my dad, so it's back to the blue loom to make another pair. I had used 28 rows for the foot for these ones, and I think I'll make do with 20 this time. I've estimated that (with this yarn) there are four rows per inch. Wish me luck! Here are the slippers, finished. One looks a little bit bigger. It really is the mysterious expanding slipper. I counted the rows about a million times, so I know they're the same size, and yet… and yet… One is HUGE! Now here's the really odd part–they fit B! I mean both of them, and last time I checked he didn't have different sized feet. Something strange is definitely going on.